Dr. Eric Okamoto worked with Rosemont Media’s internet marketing team to create a digitally-advanced medical website design for his plastic surgery practice located in Fremont, CA. The customized site is fully equipped with the latest search-engine marketing components and built with a user-friendly interface to enable current and prospective patients to seamlessly access a comprehensive span of procedural information. Highlighted by drop-down navigational tabs, interactive buttons, and an aesthetically-pleasing layout, Dr. Okamoto’s site is built to enhance the online experience of each viewer. The new website encompasses all of Dr. Okamoto’s surgical and non-surgical procedures ranging from breast augmentation and tummy tuck surgery, to CoolSculpting® and BOTOX® Cosmetic. Along with detailed descriptions of each treatment, Dr. Okamoto’s procedural pages include before-and-after pictures as well as links to his gallery pages where patients can view possible results for the procedures in which they are interested. Additionally, Dr. Okamoto’s site is constructed to develop and strengthen doctor-patient relationships. With a social media button linked to his Facebook page, patients can easily stay up-to-date on the latest practice news, as well as contact the office with questions and concerns from the comforts of their homes. Dr. Okamoto’s personal blog is also incorporated into his site so he can share his medical knowledge and expertise with the community while highlighting any major developments in the plastic surgery industry. 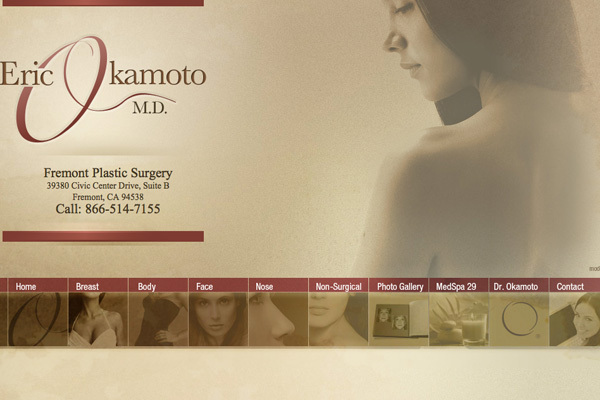 To get a better picture of the type of website Rosemont Media can create for you and your practice, visit drokamoto.com.